It's important to note this is the final book of the Ladies of the Manor trilogy. 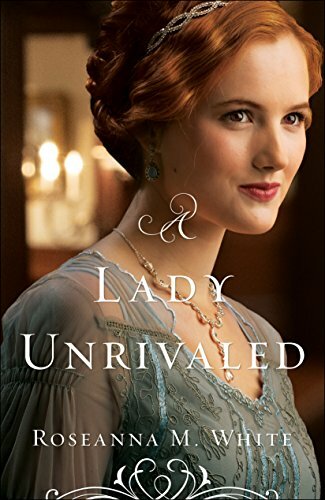 The Lost Heiress and The Reluctant Duchess will enrich your reading experience with A Lady Unrivaled. The author kept the momentum going with A Lady Unrivaled. Lady Ella Myerston was by far my favorite heroine with her sweet disposition and optimistic viewpoint. Although she often trusted to a fault, she eventually gained wisdom in dealing with others. Lord James Cayton was something of a cad, leaving two broken hearts behind him. He's changed his ways, but past friends and his own sense of guilt aren't making the transition easy. The best thing he can do is stay away from romance and keep from hurting another innocent woman. The story is a keen reminder of how our past can affect the way we respond to current events. The strong spiritual thread in these books pointed the way to true transformation from the inside out. The mystery of the Fire Eyes is a key component in this trilogy. The tensions and complications cause the characters to dig deep and reveals both their strengths and weaknesses. Overall, A Lady Unrivaled was my favorite of the trilogy. Five stars for A Lady Unrivaled and the overall trilogy. I've started her latest series because I enjoyed these so much. Yes, I'm currently on a Roseanna M. White marathon. :) Her intriguing storylines always manage to hook me. Disclaimer: Neither the author nor the publisher paid me for a favorable review. All opinions, as always, are mine and mine alone. Writers and Readers: Does a strong Christian take-away influence your choice of fiction? Please share.